My good friend Petter Bjørstad and his friend Eric Vetterlein had traveled all the way from Bergen to ski Høgstolen, Storbua and Seljebottinden this weekend. Petter asked if I had opportunity to come along on one of these trips, and as I was working both Friday and Saturday, it had to be Sunday. 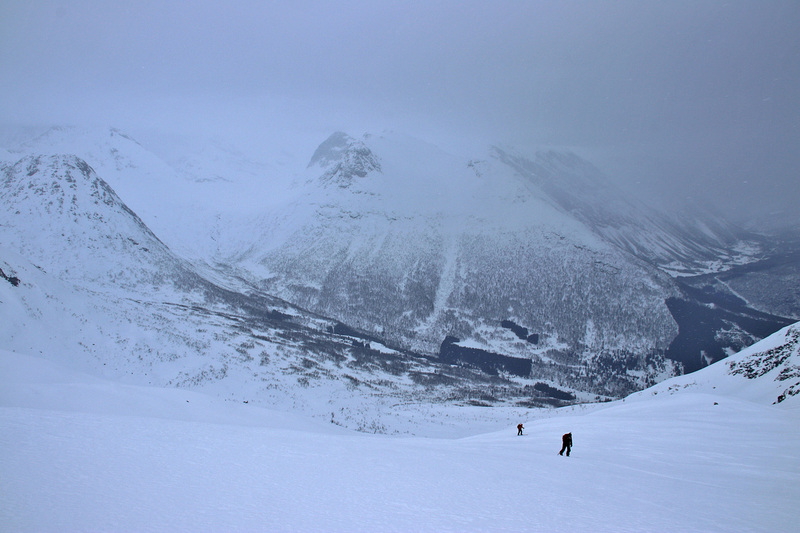 And hopefully – Sunday’s trip would be to Seljebottinden – which I hadn’t been to. Whether I was lucky, or if Petter changed his priorities, I don’t know, but Sunday’s trip would be to Seljebottinden. The next morning, we drove as far as we could get on the road towards Valldalssætra, which wasn’t very far. We might as well have skied from the cabin. We headed out 7:20am, on a nicely prepared track. It was a beautiful, cold morning, but the weather forecast suggested it would ot last. Petter figured he could have driven on this (toll) road, but that’s like … out of order, when the preparations are for skiers. On the Valldalsætra road. Myklebosthornet above. After 1,8km, we left the road and headed up the birch forest. We could see the summit ahead of us, far up there. 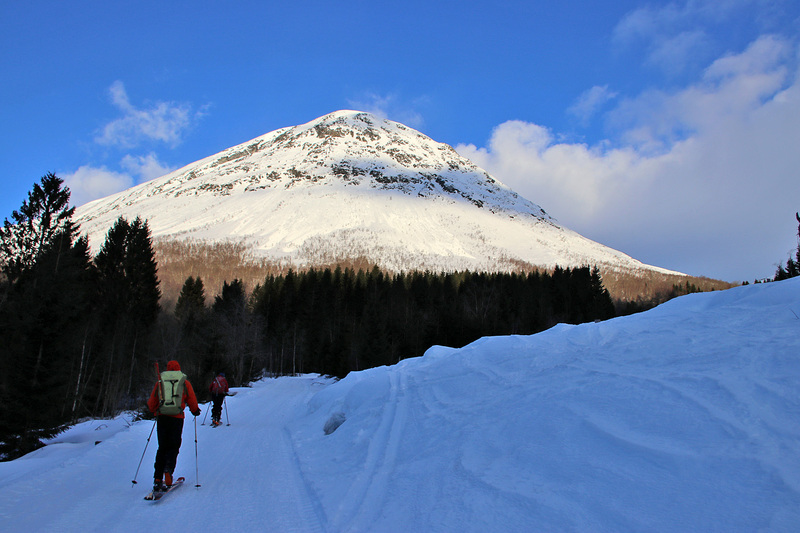 This is NOT the normal winter route to Seljebottinden, but Petter had heard about someone skiing this way, all the way to the top. In any case, we were relying on finding the gully between Firskorne and the summit, which would take us on the summit ridge. I had a feeling that the gully wasn’t there, given the large amounts of snow. The weather forecast was correct, and the weather gradually deteriorated. Visibility dropped and there was snow in the air. Still, it was a nice ascent. Good snow and little wind. 10:15am, we decided to take the skis off. There were pitches with hard snow where it was difficult to get a grip, and with the flat light, we couldn’t really see much. 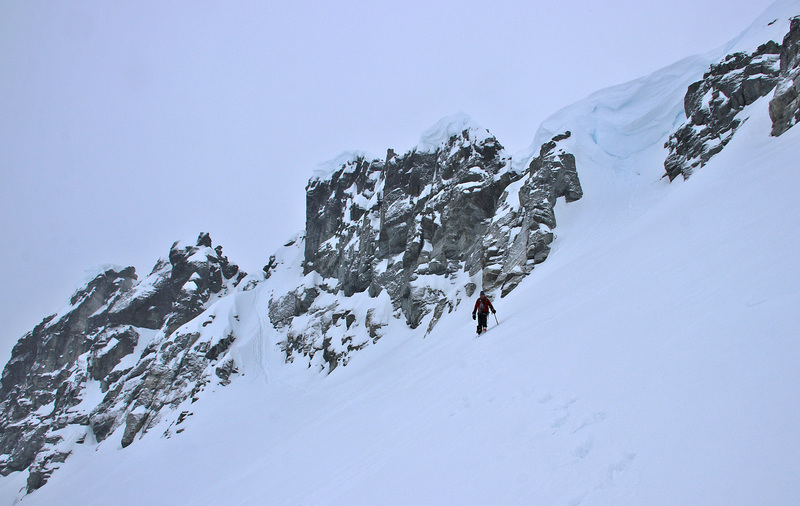 We were just 200m away from the gully, which was no longer a gully, but a HUGE cornice. Petter reckoned we could just dig our way up, and I reckoned he was crazy. Eric decided to not take part of the climb. It would surely be a climb! Petter noticed another potential route up to the ridge, further left. This meant we would have to make our way on the other side of the ridge, as the ridge itself (Firskorne) looked like serious climbing. I went up this route, which was pretty steep. And it felt even steeper, as the snow wasn’t very firm. 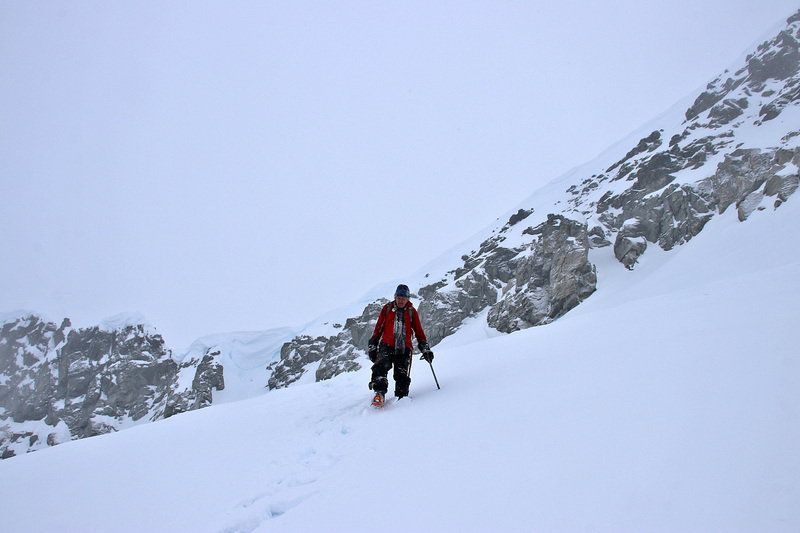 But at least I felt there was some kind of grip when I jammed the ice axe as far into the snow as I could. 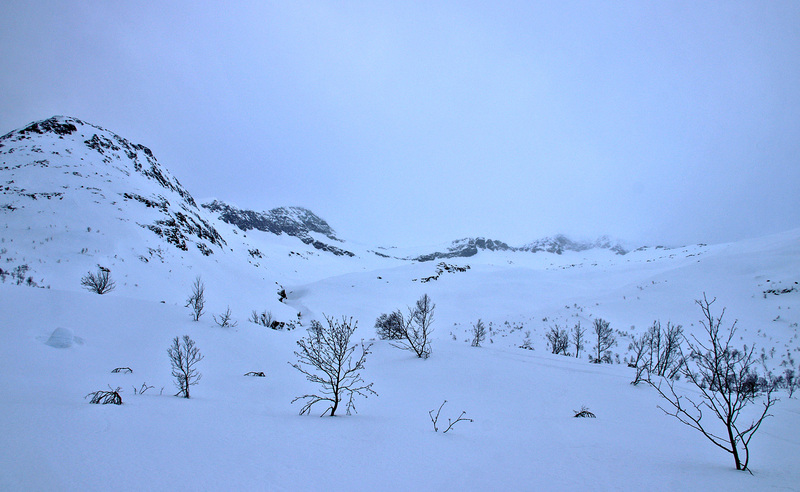 But when I was only meters away from the ridge, the snow turned into powder snow without any bottom. Being highly exposed, I reported back to Petter that this was a no-go for me. Petter responded that we should go back to the cornice. I never had any faith in getting up the cornice. If – I unwillingly – had to be in unpleasant terrain, I’d rather take my chance on the route I had just abandoned. After some digging and gaining some altitude, I was loud and clear about a no-go on the cornice, and I managed to convince Petter to go up the other route and see if he would come to the same conclusion as I did. Or – decide to proceed. If he proceeded, I might be willing to follow. And so we went back up the other route. But when he got to the point where I turned around, he came to the same conclusion. Either we would need a belay, or we would have to dig our way through the powder snow. Which would take a long time. We agreed that we had given it a decent go, and the mountain would still be standing there. Another day, another season! Back at the skis, we thought Eric had left us. His skis weren’t there. But then I heard him calling from above. He had found himself a most excellent shelter below the ridge. Descending the upper part was medium fun. Visibility was low and the snow was unpredictable. But we didn’t have to go far before we could enjoy wonderful powder snow. And our ascent track gave us the necessary contour we needed in the snow. Further down, we could ski wherever we wanted to. A very enjoyable descent! 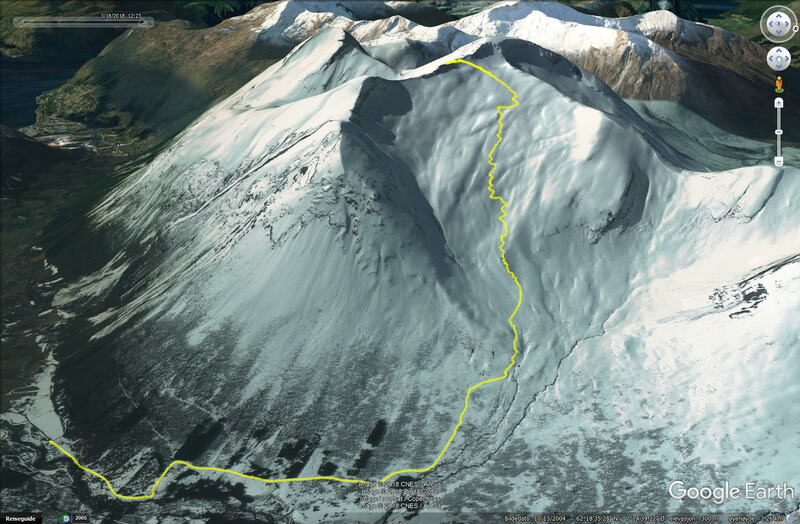 The summit – up there! 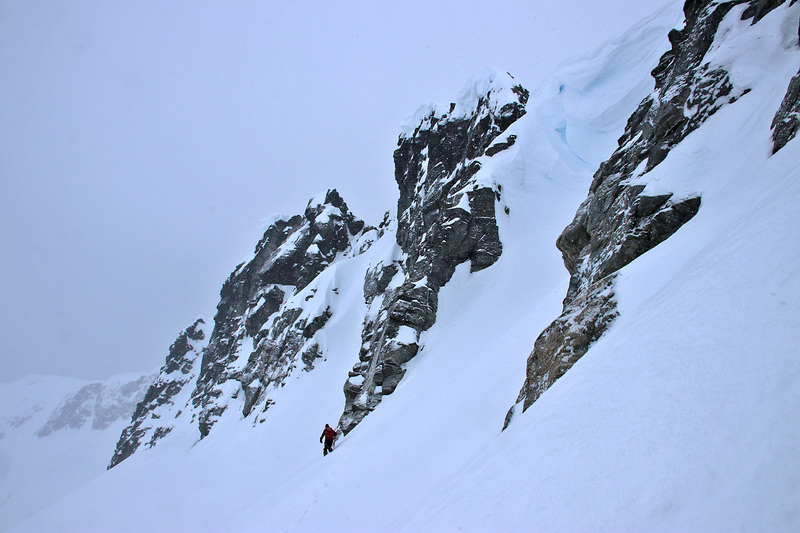 Very nice trip report and very wise choice to report to your team mates the issue with the powder snow and cornice!